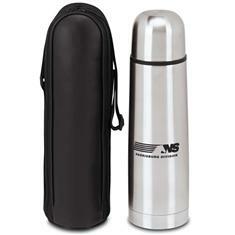 Our Insulated Thermo with Case is sure to please any coffee lover. With double wall Stainless Steel construction that is Vacuum insulated it will keep beverages either hot or cold for hours. The Stainless lid has a plastic line which doubles as a drinking cup. The case is made of PVC coated woven Polyurethane and has an adjustable strap for easy carrying. Make them smile with this gift! Imprint Area: 2-1/4" x 2-3/4"